YOU CAN NEGOTIATE ANYTHING AS LONG AS YOU KNOW HOW TO MAKE ALL THE RIGHT MOVES. Dealing with a rent increase is one of those difficult negotiation situations that needs to be backed by top-notch negotiation skills. Whether you’re a new tenant, on the cusp of renewing your rental lease or you’ve been handed a yearly rent increase the ball is now in your negotiation court. The art of negotiation can be used in just about any situation even when someone says the price is firm. Even then if you have the right backing power you might be able to squeeze in a discount or in this case negotiating a rent increase that doesn’t fit with your current budget expenses. Rental prices in our area have gone through the roof in the last couple of years. If you are a family with 2 children and need to rent a 2 or 3 bedroom apartment you’ll be looking at near $1200-$2000 a month whether it be in a basement apartment, one level of a house or apartment complex. An apartment complex is typically run by a property management team and basement apartments and house rentals have landlords who own the property. Even then if the entire house is rented the landlord may have many properties listed under a company name. Related: Do I need tenants insurance when I rent? Apartment rent prices tend to go up every year where if you rent privately and have a good landlord and you’re good tenants they may just waive that rent increase just to keep you there. When living in an apartment building it can be tougher since they are run by a property management team who gets direction from the top. Don’t give up hope though because just like the homeowner landlord apartment buildings aim for the best tenants as well, but don’t always get them. Absolutely, why not? Most people don’t think to negotiate rent because it’s not something that is talked about. You pay what the landlord wants and that’s it. You could be paying more than you need to because you CAN negotiate if you jump in to bat. If you don’t try then you will never know but you must have reasons behind why you want to negotiate a rent increase or a new tenant rental agreement/lease. You can’t simply tell your landlord that you can’t afford the rent or they will tell you to go somewhere else. Landlords want quality tenants and if you are one of them they you have potential bargaining power. If you’ve lived in an apartment building for years or even one year you have more leverage then the person coming in as a new tenant to negotiate a rent increase. Why? Well if you’ve been good and pay your rent on time they already know what type of tenant you are. You just need to remind them when you ask for a decrease in rent along with a reason. A legitimate one, not one you made up because you’re too cheap to pay for the rent increase or need it to buy stuff you can do without. Taking advantage of a negotiating system only ruins it for those who legitimately need it and are good tenants. Keep in mind that just because you think you’re a good tenant doesn’t mean you are. You don’t know what the landlord has seen or what they have heard either. In some cases they might want you to leave in hope that you can’t afford a rent increase so you will go. How to negotiate rent with property management? Property management negotiations may be tougher to maneuver through then renting from a landlord. Again, apartment buildings have their fair share of problems with tenants including the police showing up quite often. Mrs. CBB lived in an apartment building when she first moved out on her own and it was nothing but police, ambulance and fire trucks weekly. It’s not easy finding the perfect tenant but there really isn’t a perfect tenant out there. You might be the ideal tenant that they are looking for so it’s important to play on this need or desire that they crave. The less hassle they have to deal with when it comes to tenants and their apartments, the better. If you can prove to them that you are an excellent tenant or will be then you might be in luck. The costs involved with negotiating a reasonable rent with good tenants is huge to a landlord or property management team. Less expenses means more profit and money or upkeep on the properties. My advice would be to know what you want before you go in and arm yourself with research and lots of positive things to say about your rental habits and needs. Trying to convince them that you are worthy of a rental decrease takes more than just getting upset and telling them that you will move. They won’t care if you don’t care. Respect goes a long way. I can offer you all the rent negotiation tips today to help you out but only you know your landlord or property management team and the way you live as a tenant. If lower rent is on your mind because you simply can’t fit a rent increase into your budget let it be known. Make sure you take all avenues of earning extra money into consideration as well. Simply adding a few hours of over-time, part-time job, buying low and selling high, using your skills , or re-arranging your budget categories might just help. If you don’t attempt to do any of the above don’t bother trying to negotiate a rent increase. If you can’t be bothered to do something about it first then why should anyone accommodate you? Let this be known as well when you approach your landlord or property management team so they understand what you’ve done and been through. Negotiating a rent increase with your landlord if you live in a house may be easier as you could offer to maintain the property if that is not in your lease instead of the increase. Saving the landlord money from hiring a company to do the property maintenance or him/herself might be the ticket to your rent decrease. We have friends of ours who rent a country property and the landlord reduced their rent by $300 a month and told them not to call him for anything unless the house burnt to the ground or it was a major issue. This worked out perfect for them as they are battling large debt amounts and not getting a rent increase is a big deal. You could also offer your skills as a trades-person to do repairs around the house or possibly fix their car or truck, cut hair in exchange for a rent decrease. There are options if you sit down and think about what it is you can offer to your landlord in return. If there is nothing then all you can do is tell it like it is, have a game plan and hope for the best. Housing prices everywhere are getting expensive and many homeowners are struggling to keep afloat financially. Millennial home buyers who are buying their first home, seniors or even those who have lost a job, been injured on the job or simply can’t afford the mortgage want you to help them pay the mortgage. For this reason you may find they are renting out their basement or other parts of the home which means an excellent tenant is worth holding back on a rent increase. Once you have your game plan and negotiation tactics in place start practicing. You can practice in front of a mirror or with someone else who plays the role of your landlord. This may ease some anxieties about talking with your landlord and make the meeting go smooth. I’ve put together a sample rent reduction letter that you could pass along to your landlord if the case arises that you just can’t afford to live where you are any longer. Don’t be ashamed and tell the truth but also remember to state why you’ve been a good tenant and what you like about the property management team and building you live in. I’d type this in a pre-set Word document, print and evenly fold it and insert into an envelope. Either deliver the rent reduction notice by hand or mail it. Keep in mind mailing it will take a bit longer to arrive and possibly never arrive. Go for personalized service if you can because then you know they have the letter without the worry. 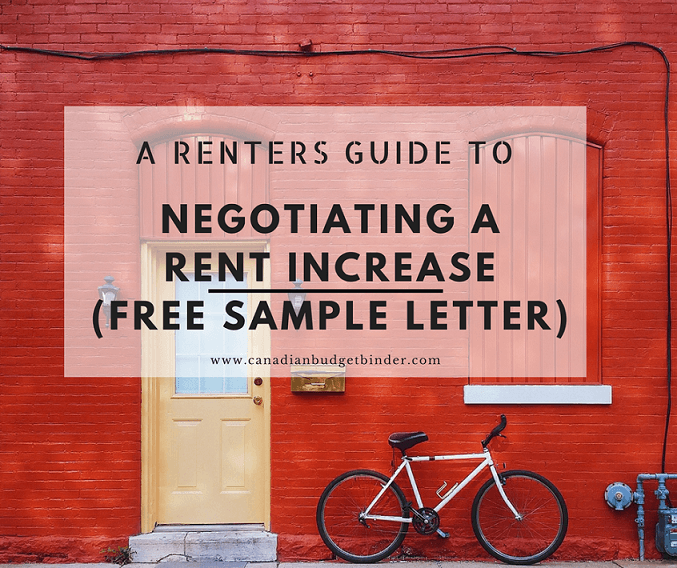 Below is a sample letter to negotiate rent increase or if you would like to ask your landlord for a rent decrease or simply to negotiate rental costs. You can also get the word document or pdf over at my Free Downloads page. I’ve done the work for you, now you can fill it in with the personal information you need. I’m writing you today on the recent rent increase notice that we were given last week for apartment 14 at 201 Singer Drive. My family and I have lived in this building for 7 years and absolutely love it here. We’ve been excellent tenants and always pay our rent on time with no disputes on record. Our apartment is kept clean and tidy and the perfect fit for family with each child having their own room. This rent increase although only $50 extra a month is difficult for us as it takes away from our food budget. You probably know I’m on/work (fill in the blank) and struggling to balance our budget. I’m hoping that we could negotiate a rent decrease to last years amount so we could continue living here and our children can go to the same school. I’ve spent the last month putting down goals on paper so I can execute new ways to bring in extra income so I’m prepared for such situations including an emergency savings account. In the meantime we will continue to work on our budget and try to find ways to earn extra money for the next increase in (enter year). If at all possible I’d like to discuss this more with you in person or over the telephone as I/we truly want to stay living here. In your letter you could also add what might be happening in your life so they get a bit more background about the difficulty for you. For instance if you just started a new job, family crisis, reduced hours, lower pay, injured and on WSIB, new baby, illness etc. You may not think it’s relevant but it helps with negotiations because they know you are being transparent and sincere. Keep in mind if you’re negotiating a rent reduction don’t go in for the kill with a massive request. What I mean is that if you try to get over $100 off your rent it may be tough but attainable. Even $100 will save you $1200 a year or $200 would be $2400 a year. That’s lots of money when the bills are already tight. Not all landlords especially those who work for a property management team will even consider outrageous rent reductions. They have a bottom line and staff to pay as well so you must prepare your letter to be precise and to the point. If you do attempt a larger rent reduction possibly you could offer your services in return. Ultimately, don’t be afraid to do what you have to do if you don’t have the money to pay for a rent increase your landlord has asked you for. The worst thing you could do is nothing at all. Discussion Question: What other ways could tenants negotiate a rent reduction? Make sure to follow me on Social Media by clicking any of the links below. Subscribe to CBB today to have access to all of these free tools and Finance tips. Should I buy a cheaper or more expensive house? This is such a great article and has helped us tremendously in drafting a negotiation letter for rent increase despite great change and disturbances in our community. We’re anticipating the very best and will definitely keep you posted on the results. I’ve totally negotiatied on the front end when I was moving in, but have never had the courage to negotiate as the increases came. Definitely should, though! Thanks for these empowering tips! I’m all about the negotiating but in this case if someone has been the ideal tenant and asks if the landlord could hold off on an increase they might just get the nod because the landlord wants them to stay. Thanks for dropping by. FF> 🙂 Nice to hear from you.